CEBU Pacific Air has opened a new international route to Shanghai from Cebu, offering promo base fare of 1 peso until the end of the company’s anniversary month of March. Cebu Pacific’s Cebu-Shanghai and return flights will be six times weekly starting April 15, 2019. Charo Logarta Lagamon said the new route will make Cebu a bigger international hub, as it also connects other Visayas areas like Dumaguete and Iloilo as well as Mindanao cities like Davao and Cagayan de Oro with Shanghai via Cebu. Logamon is Director for Corporate Communications Corporate Affairs of Cebu Pacific. Logamon and Director for Marketing Blessie Cruz led today’s announcement in Hai Shin Lou in Marco Polo Plaza Cebu. The new Cebu-Shanghai route increases the airline’s international destinations out of Cebu to six. TO SHANGHAI. Charo Logarta Lagamon, Cebu Pacific Director for Corporate Communications Corporate Affairs, announces the start of the Cebu-Shanghai route. Cebu Pacific will fly the Cebu-Shanghai route six times weekly, departing Cebu every Monday and Friday at 6:45 p.m., every Tuesday and Thursday at 7:05 p.m., and every Wednesday and Saturday at 11:55 p.m. Flight arrives in Shanghai at 10:45 every Monday and Friday, 11 p.m. every Tuesday and Thursday, and 11:10 p.m. every Wednesday and Saturday. Flights to Cebu leave Shanghai at 11:45 p.m. every Monday and Friday and 11:55 p.m. every Tuesday, Wednesday, Thursday, and Saturday. Arrival times in Cebu are: 4 a.m. every Monday and Friday and 4:10 a.m. every Tuesday, Wednesday, Thursday, and Saturday. Cebu Pacific currently has a network of 37 domestic and 26 international destinations with 2,100 weekly flights. ANNOUNCEMENT. 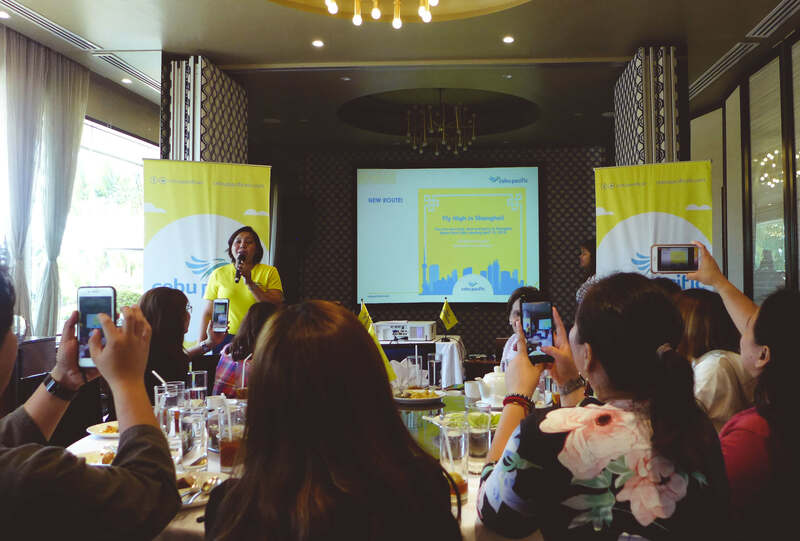 Cebu Pacific Director for Corporate Communications Corporate Affairs Charo Logarta Lagamon and Director for Marketing Blessie Cruz led the announcement of new routes. Shanghai is a major industrial and commercial hub in China with quite a colorful colonial history. That ancient network of trade routes called the Silk Route which connected East and West started out of Shanghai, and visitors can check out such attractions as The Bund, Yuyuan Gardens, and Shanghai Tower, added Lagamon. Cebu Pacific said it is committed to growing the Cebu hub, by continually increasing flight frequencies and adding more domestic and international routes.